http://www.JewishWorldReview.com | "Where are all the moderate Muslims?" It's a question often posed by Americans who watch with disgust as the Council on American-Islamic Relations and other apologists for radical Islam hog all of the attention. CAIR, which was named as an unindicted co-conspirator in the terror financing Holy Land Foundation case, and which regularly denounces any effort to combat radical Islam as anti-Muslim prejudice, is routinely described in the press as a Muslim "civil rights" group. Moderate American Muslims exist though. And it's not that hard to find them. 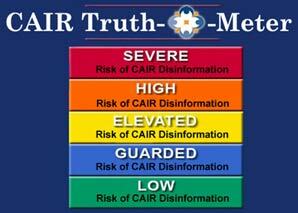 Just see who CAIR and the Muslim Public Affairs Council are denouncing. This week, they are after Dr. M. Zuhdi Jasser, founder and president of the American Islamic Forum for Democracy. Sen. Mitch McConnell has appointed Jasser to serve on the U.S. Commission on International Religious Freedom, and this has sent the most prominent Muslim American organizations to the barricades. A dishonest character assassination campaign has been launched against Jasser, urging Muslims to protest the appointment. CAIR spokesman Ibrahim Hooper told The Blaze that Jasser "has long been viewed by American Muslims and the colleagues in the civil liberties community as a mere sock puppet for Islam haters and an enabler of Islamophobia." So who is Jasser? He's the son of immigrants who fled Baathist Syria in the 1960s. Syrians, as we have seen in the streets of Homs and other cities over the past 12 months, are among the bravest and most oppressed people in the world. Zuhdi, a devout Muslim, attended the University of Wisconsin and then joined the U.S. Navy and earned a medical degree from the Medical College of Wisconsin. His 11-year service in the Navy included deployments to Somalia and service as the internist on call for the U.S. Congress. Now a full-time physician and specialist in nuclear cardiology in Phoenix, Ariz., Jasser also founded the American Islamic Forum for Democracy. "AIFD's mission," he explains, "is derived from our love of America and our devotion to Islam. (We) ... believe that Muslims can better practice Islam in a free environment that protects the rights of all individuals to practice or reject faith as they choose." In contrast to CAIR and some of the more frequently quoted American Muslim groups, Jasser and AIFD do see a problem with radicalization within the Muslim world. They reject the reflexive cry of discrimination in response to fears of Islamist penetration of mosques, prisons, schools, and other institutions. "Our civil rights should be protected and defended," Jasser testified to the House Homeland Security Committee, "but the predominant message to our communities should be attachment, defense and identification with America, not alienation and separation." Jasser insists upon the centrality of ideas. Most American Muslims are not radical, but the lures are plentiful. He compares himself with Major Nidal Hasan, the military psychiatrist who committed mass murder at Fort Hood. In so many ways, their lives were parallel, but Jasser became a profound American patriot and Hasan became a murderous traitor. The key, Jasser insists, is the poison of Islamism (political Islam) that has infiltrated the American Muslim world just as it has spread throughout the globe in the past 50 years. Supported by petro dollars and disseminated through the North American Islamic Trust and the Assembly of Muslim Jurists of America, among other organs, Islamism alienates young American Muslims from their country by teaching that their first loyalty is as citizens of the "umma" (the Islamic community). "(Hasan) did not go to sleep one night a normal, compassionate, patriotic Constitutional American Muslim military psychiatrist and wake up the next day a barbaric radical wanting to viciously murder his fellow soldiers," Jasser testified. His mind and character were distorted by Islamism. Middle East scholar Daniel Pipes has said, "The problem is radical Islam. The solution is moderate Islam." Most nonMuslim Americans are not in a position to affect the ideological struggle that is going in within Islam. The battle must be waged by groups like the American Islamic Forum for Democracy. But there are things we can do. We can stop enabling the most destructive voices within the American Muslim world by pretending that they speak for American Muslims. We can stop indulging the fiction that concern about Islamic radicalism amounts to anti-Muslim discrimination. And we can do everything possible to support and honor those, such as Zuhdi Jasser, who are manfully battling the forces of darkness.